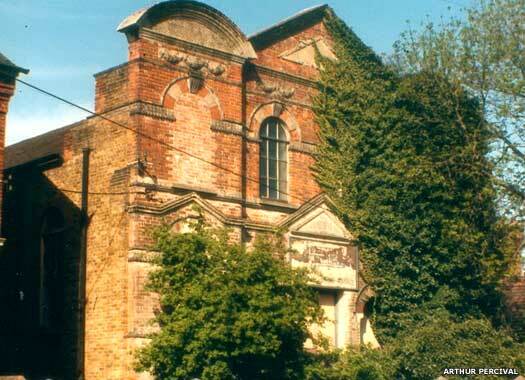 Abbey Place Primitive Methodist Chapel lies on the northern side of the short Abbey Place, at the northern end of Faversham. This was the first of two Primitive Methodist chapels built in Faversham, opening about 1855, forty-five years after the founding of the movement. The building was replaced by the Stone Street chapel in 1898 (see below), but it survives today, albeit somewhat butchered. By 2005 (shown here) it seemed to be serving as some kind of warehouse. 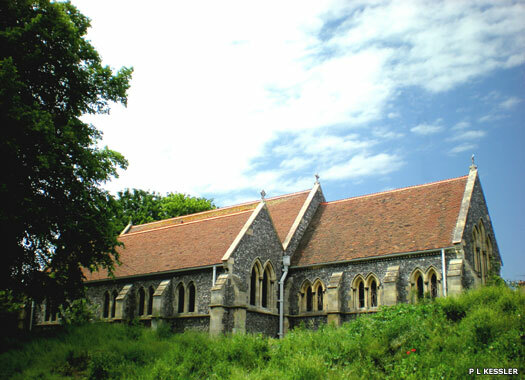 St John the Evangelist, parish church for The Brents & Davington, is on Church Road, at the north-eastern edge of Faversham. It is reached via the swing bridge over Faversham Creek. The building was consecrated in 1881 for what was then a newly built-up area, funded by the widow of William Hall, the local gunpowder and explosives magnate. 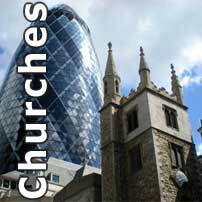 It was known familiarly as 'the Brickies' church, thanks to the large number of parishioners who worked on the nearby brickfields. The church was declared redundant in 2000. The last service held was Evening Prayer on Sunday 26 November 2000, which was led by parish priest-in-charge the Reverend Ian Black. 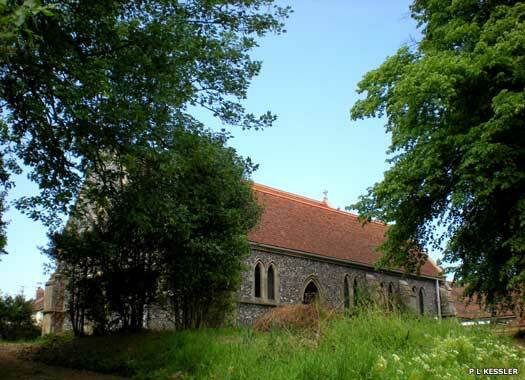 Then it was sold by the Diocese of Canterbury to someone who declared they would convert it into a community hall and function room, but who instead sold it on. 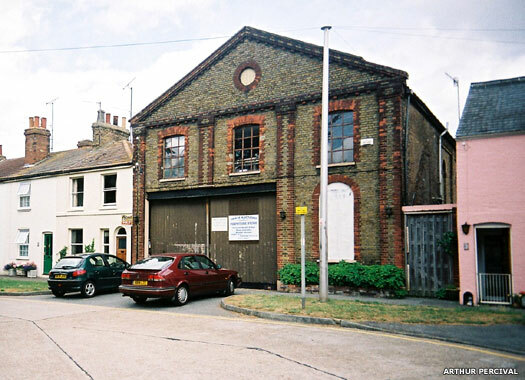 In 2009 an application was submitted to turn it into a house with parking facilities, but by mid-2009 it remained abandoned. Partridge Lane Chapel lies midway along the southern side of Partridge Lane in northern Faversham, close to the Shepherd Neame brewery. Nonconformity arrived a little late in Faversham, becoming apparent in the late eighteenth century. In 1789, the Countess of Huntingdon's Connexion of Independent nonconformists opened this plain red-brick box of a chapel. It was replaced by the Congregational church in 1878. The building is now used by Shepherd Neame. 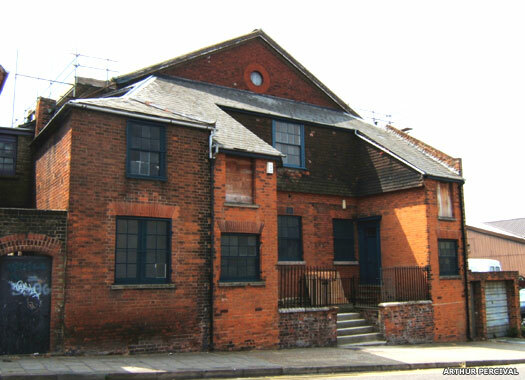 The Salvation Army Citadel is still plainly visible on the northern side of Stone Street in the centre of Faversham, opposite the entrance to Union Street. It was opened by the Army around the beginning of the twentieth century, possibly about 1905. 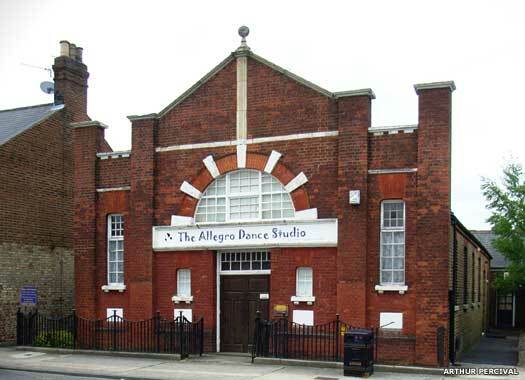 At least one member of its brass band was still playing in the Canterbury Salvation Army band in 2010, by which time the former citadel in Faversham was being used as the home of the Allegro School of Dancing. Stone Street Primitive Methodist Chapel (shown here in 1985) lay on the north side of Stone Street, with the Cottage Hospital between it and Bank Street. Opened in 1898, it replaced Abbey Place chapel. The Primitive Methodists merged in 1932 with Preston Street church, so the Bible Christians took it over until they also joined Preston Street before the war. After some years of secular usage, it was demolished in 1986 and replaced by an extension to the hospital. Four photos and text on this page contributed by Arthur Percival.